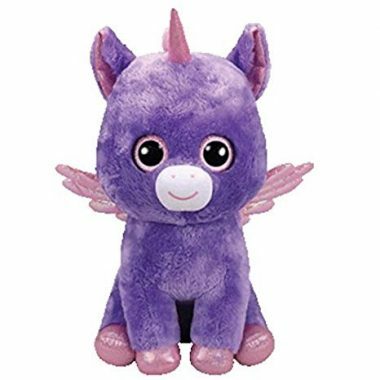 Athena is a beautiful purple winged unicorn with large pink glittery button eyes. She has a sparkly pink horn and hooves of the same colour. Her wings are an iridescent pink. She has a white nose with a pink embroidered smile and nostrils. And then when I get there my wings let me fly. Athena was released in November 2017. Athena is a Claire’s exclusive Beanie Boo. There are four different version of Athena. This is the large 12″ variation. A 6″ Beanie Boo, a medium 9″ version and a key clip also exist.